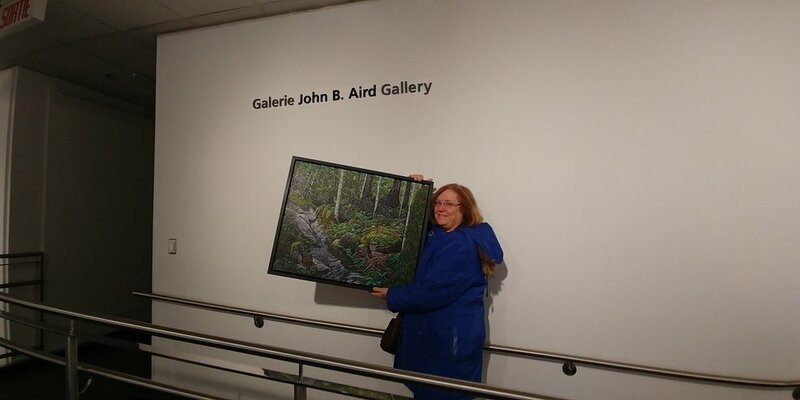 Successfully delivered my painting titled "Gully" to the John B Aird Gallery to be shown in the Ontario Society of Artists 145 Annual Juried show. Felt very honoured to have been selected and it was a wonderful exhibition. SOVA has a new exhibition up at the Joseph D. Carrier Gallery, in the Columbus Centre. The opening reception was a great success, and a lot of people attended, which was nice because there is always a lot of work involved in setting up a show. This exhibition continues until May 28th. Above in the photo with the SOVA sign , you see me with my studio mates, Charlene Nickels on the left, Robert Chisholm in the middle, and myself. I was notified this week that I was selected as one of the top 12 finalists ( apparently out of several hundred International entries) of the recent LIGHT SPACE TIME Online Gallery “Solo Art Series” #9 Art Competition. Four of the 12 were selected to have a solo online exhibition, and I am with the remaining 8 that will be featured in the gallery's Artist Showcase Section. "The process of selecting 12 finalists from those who entered was extremely challenging. The high quality of submissions made creating the final rankings excruciating. You should be very proud of your achievement in making the finalists and ultimately into the Artist Showcase. We are very excited about featuring your art on our website. In addition, we will also be featuring and promoting your art in 350 worldwide press releases and in our various social media networks for further exposure to the artist. Thank you for your attention to these matters and again, congratulations!" Time to get back to the easel.